Sheriff-at-large Baron Godric MacEuan is testing his new prototype siege engine when King Malcolm summons him: Stop a rogue Viking earl from raiding convents and monasteries, murdering clerics to steal treasure. But OdinsØye has hidden well, in an impregnable stone tower concealed within an isolated loch. Can it be taken? Can OdinsØye be stopped? Or will attacking him instead start a vicious new war between Scot and Viking? Read BONE-CRUSHER to find out! A TALE FROM THE SIEGE MASTER SERIES, THE EPIC STORY OF THE FIRST CRUSADE, TOLD AS NEVER BEFORE: THE FIRST-PERSON NARRATION OF A SIEGE LORD WHO BATTLES TURKS, TRAITORS, STARVATION AND DEATH ITSELF TO WIN A CRUSADE AND RECLAIM HOLY JERUSALEM. I wrote this novella to introduce readers to the SIEGE MASTER series and CALL TO CRUSADE, the first book of the series. 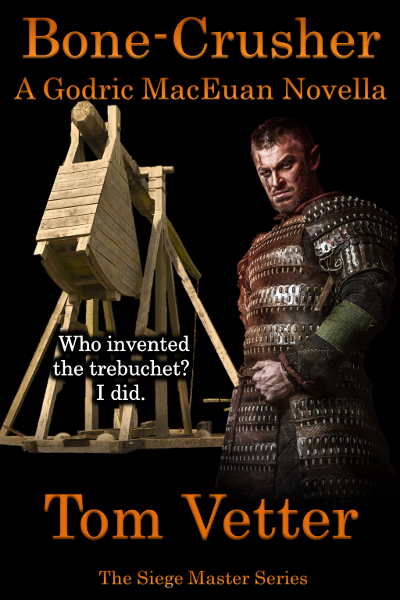 It has all of the action and intrigue of full-length novels, a memorable cast of characters from the series, and a unique point of view: That of a brilliant young siege master who fights with his brain even more than his brawn. The Siege Master stories offer readers a fresh new look at the Middle Ages: stories of warriors just as smart as the finest fighting men of today, resourceful men who make novel use of the engineering skills and high technology of their age to defeat impregnable fortresses under insurmountable odds. Best of all, the stories are fact-based — rousing fiction threaded through real history!